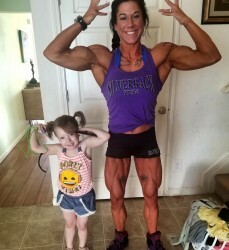 IFBB PRO Mom of five, womens physique competitor, trainer, and coach. Ms. Health and Fitness and Jared Allen's Homes for Wounded Warriors would like to thank Alyssa Isley and her voters for helping us donate $179,724.93 to our injured United States military veterans! Quit making excuses. Stay dedicated and be patient with your self and the results. Push push push and always remember why you started. It shows my children to dream big and never lose hope.. through all losses and times you fail, just get up and keep going you will succeed. I have been able to inspire and help so many others. I have made friends and grown as woman, wife, and mom.